Rub the body with Dead Sea Concentrated Water and massage for three minutes before rinsing off. Benefits: Regular use can help prevent dry, tight, and itchy skin. Tip: The Dead Sea Concentrated Water has sterilizing property, therefore contacting with wound or sensitive parts may cause mild burning sensation in a short moment. Fill the tub with 80L warm water (about 37c), add 200 ml Dead Sea Concentrated Water into the tub and relax in the bath. Soaking for an approx 20m, rinse your body with fresh water. Benefits: Bathing with Dead Sea Concentrated Water helps relieve muscle fatigue and soreness. Fill Bucket with Luke Warm Water, Add 100ml of Dead Sea Concentrated Water, then rest the feet in the bath and relax. After soaking approx 30m, rinse the feet with fresh water. Benefits: The foot bath helps eliminate bacteria and foot odor. 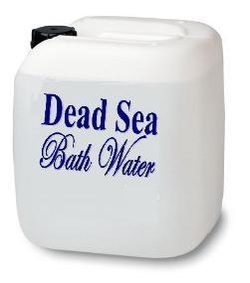 For user who has athlete's foot or bacterial infection, the Dead Sea Concentrated Water can also be directly rubbed on the infected area after the bath. Mix 5ml of Dead Sea Concentrated Water with 25ml of milk, soak a facial mask paper into the solution then put it on for 10 minutes (avoid contact with eyes and lips). After taking the mask off and rinsing the face with warm water, it is recommended to put on moisturizing cream for a better result. Spread the Dead Sea Concentrated Water over the face, massage the face in a circular motion for 2 minutes then rinse with cold water. The Dead Sea Concentrated Water helps remove impurities and excessive oil. When washing the hair, mix Dead Sea Concentrated Water with shampoo, massage the hair for 5 minutes then rinse with fresh water. The Dead Sea Concentrated Water helps maintain freshness of hair extensions and weaves, it also prevent excessive oil that causes hair loss. 1- Add 5 drops of Dead Sea Concentrated Water to the toothbrush and brush the teeth and gum directly. Benefits Using the Dead Sea Concentrated Water for tooth and gum care can reduce the acidity inside the mouth. Add 15 drops of Dead Sea Concentrated Water in a sponge rub around the armpit area then rinse with fresh water. Benefits: This helps cleaning up the sweat and preventing smell. Samples : Our company does not charge for the Samples (Test Samples 100ml are free), but due to the high cost of shipping, the delivery must be paid or Arranged by Buyer. Amount spent on shipping Samples will be completely returned to you in case of doing business with our Company. We hope and wish to have your total understanding on this delicate matter.